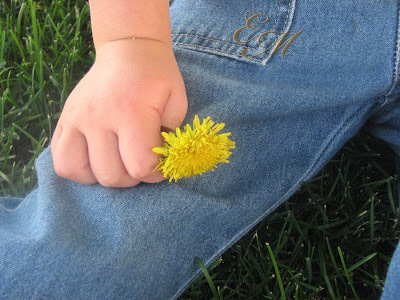 Somewhere along the way we stop thinking of dandelions as beautiful yellow flowers worth stopping to pick and carry home to mommy and we start looking at them as a very undesirable addition to an otherwise beautiful patch of grass. I often times think that the way someone looks at a dandelion says more about how old they are than what their true age is. The question is, when does this change occur? When does ones view of a dandelion change? Is there anyway I can keep my sweet girl from reaching this unknown point? I can’t describe the joy it gives me to see her excitement over discovering a perfect yellow dandelion amongst the grass. The way she smells it over and over and genuinely sees it’s beauty is truly unadulterated innocence. Loving a dandelion is sweetness to the core. 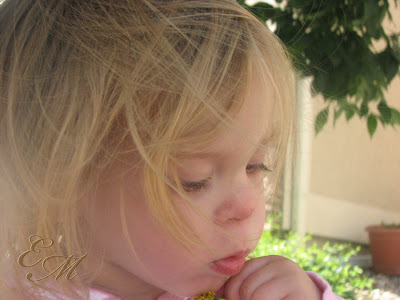 I adore receiving the little puff of bright yellow from Monkeys’ sweet little hands. What a gift it is. What a gift she is. Does This Mean I am Anti-Social? These Boots Were Made for… Everything?